connected to Viapass DS platform, managing screens content remotely. is a content management & delivery application for digital signage, video and numerous information contents. can be installed at any remote location. Fitted with player communicating with Viapass DS platform via the Internet. Compatible with cable, wireless networks (Wi-Fi), 4G router. Easily manage your content from a simple web-page administration system : edit, manage, customize screens. No software installation necessary. Management tool webpage in responsive mode for easy use on smartphone and tablet. Unlimited number of users can login to the system without any extra cost. Display signage and direction to guide visitors within the venue. Display any webpage with bespoke by simply adding the URL to the application. Display any live content by simply adding the live stream address on the application. 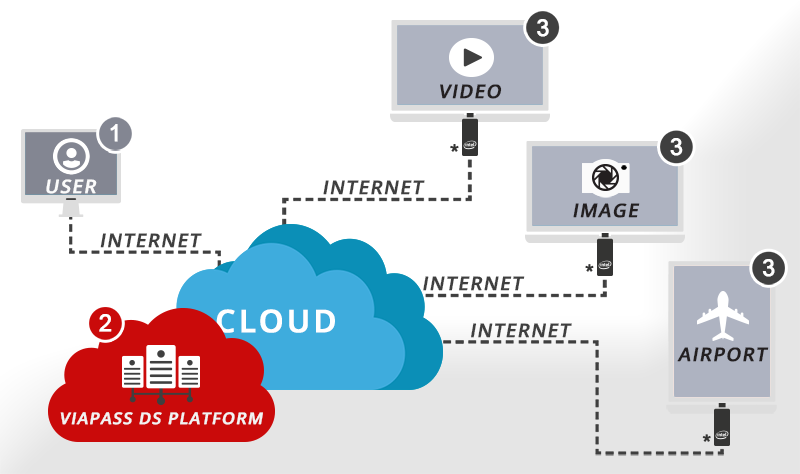 Simply copy-paste the URL to launch stored and live video streaming. Show in real time your posts. Live arrival & departure information from any International Airport. System is designed to manage multiple screens, synchronized or independant. Portrait, reverse portrait, landscape and reverse landscape orientations. Encrypted client-server communication, secured access by login & password. All inclusive solution with affordable monthly fees. No hardware investment or maintenance costs at customer site. Viapass TV is part of Viapass SAS, a french event management and technology supplier, and an Internet Operator, with 10 years of experience on the MICE market internationally. Viapass has been the Official supplier of Cannes Palais des Festivals for more than 10 years. At Viapass, we understand the importance of reliability, reactivity and quality of service. Our Clients expect us to supply cost-effective solutions and services, with the extra touch of listening and advising. We have built trust by ethical attitude and accountability. Please enter a valid "Email"
Your message has been successfully sent. We will contact you as soon as possible.